HCN's (Health Communications Network) Medical Director is the market leader in clinical software for Australian GP's and medical centres. First introduced over 20 years ago. Increase your bookings by streamlining your workflows and spending more time with patients. Handle complex invoicing arrangements including prepayments, discounts, multiple accounts, separate service items, patient estimates for informed financial consent, invoice generation and final settlements, with no need for re-keying data. Reduce no-shows using automated SMS reminders and alerts. Receive automatic updates for MBS and RMFS delivered directly to your desktop. CompuGeeks are providing support and installation services for Bluechip. There are many technicalities which can come into when setting up and using Bluechip in your clinic's network. If the requirements aren't properly met, if backups aren't done reliably and if the software is not set up suitably for your requirements, there will be many issues arise and we are here to prevent that. Whether you want to migrate from another clinical software package, set up an entirely new clinic or simply get your current system working reliably, we can help. 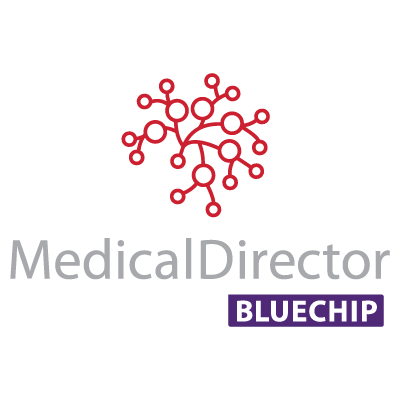 Installation and setup of Medical Director Bluechip software. Customisation of appointment books, setup of EFTPOS and Easyclaim.